제거하는 ZapR 기술이 적용되어있어 별도의 rRNA 제거 시약이 필요하지 않다. 본 제품은 Random-priming을 이용하여 역전사 반응을 진행하므로, 품질이 좋지 않은 분해된 RNA 샘플로부터 NGS Library를 제작할 수 있다. High-quality RNA로부터 Oligo dT primer를 이용한 NGS Library 제작을 진행 예정이라면 SMART-Seq® v4 Ultra® Low Input RNA Kit for Sequencing (Code 634888)의 사용을 권장한다. 그림 2. Structural features of final libraries generated with the SMART-Seq Stranded Kit. The adapters added during PCR1 contain sequences allowing clustering on Illumina flow cells (P7 shown in light blue, P5 shown in red), indexes for pooling multiple samples in a single sequencing lane (Index 1 [i7] sequence shown in orange and associated with the P7 sequence, and Index 2 [i5] sequence shown in orange and associated with P5 sequence), as well as the regions recognized by sequencing primers Read Primer 2 (Read 2, purple) and Read Primer 1 (Read 1, green). Read 1 generates sequences antisense to the original RNA, while Read 2 yields sequences sense to the original RNA (orientation of original RNA denoted by 5’ and 3’ in dark blue). The first three nucleotides of the second sequencing read (Read 2) are derived from the SMART-Seq Stranded Adapter (shown as Xs). It is best to trim these three nucleotides prior to mapping if performing paired-end sequencing. 표 1. Consistent sequencing metrics across RNA input amounts. 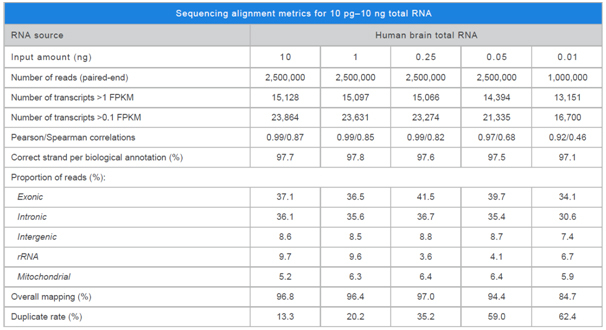 Human brain total RNA (10 pg-10 ng) was used to generate RNA-seq libraries with the SMART-Seq Stranded Kit. Data shown are the average of three technical replicates and exhibit exceptionally high Pearson and Spearman correlations between replicates, even with as little as 10 pg of input material. Sequences were analyzed as described in the Methods. 그림 3. The SMART-Seq Stranded Kit outperforms the Pico v2 kit for ultra-low inputs. Panel A. 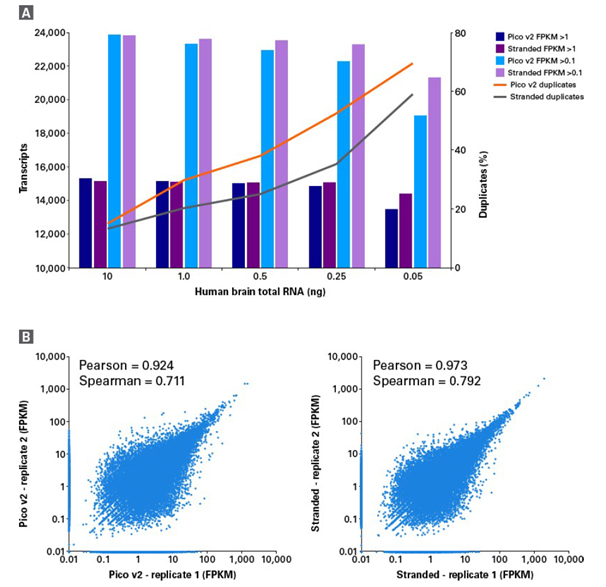 Human brain total RNA (50 pg-10 ng) was used to generate RNA-seq libraries in triplicate with the SMART-Seq Stranded Kit (Stranded) and the Pico v2 kit. For both kits, sequencing data were down-sampled to 2.5 million paired-end reads prior to analysis. Panel B . Comparison of transcript expression level from libraries generated with 50 pg of total RNA (as shown in Panel A). FPKM values are shown on a log10 scale. Transcripts represented in only one sample (dropouts) can be seen along the X- and Y-axes of the scatter plots. 그림 4. High reproducibility across cell input amounts. A375 cells isolated by FACS were used to generate RNA-seq libraries with the SMART-Seq Stranded Kit. Input varied from 1 cell to 1,000 cells, with two replicates per input of 5-1,000 cells and 12 replicates for the single cells. For comparison, two aliquots of 1,000 cells were used for total RNA purification and then used for library preparation. Panel A . Consistent sequencing metrics across 1-1,000 cells. Panel B. Hierarchical clustering heat map displaying Euclidean distance between all the samples shown in Panel A, and reporting Pearson correlations ranging from 0.85 to 0.99. Single cells are labelled Cell1-Cell12; replicates for other inputs are labelled a-b. 표 2. 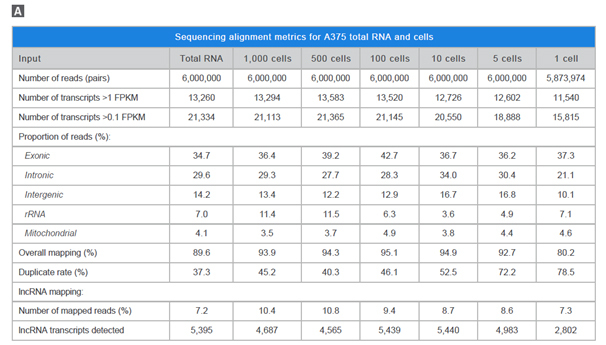 Features comparison of commercially available single-cell RNA-Seq Kits. 그림 5. 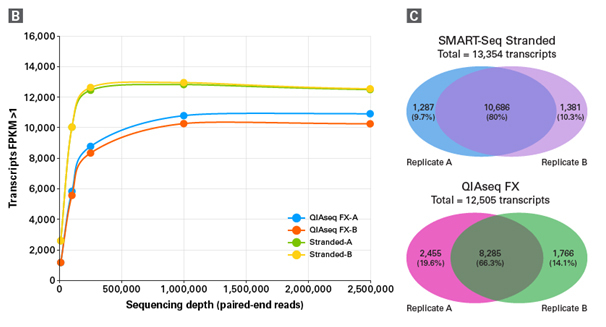 Comparison between the SMART-Seq Stranded Kit and the QIAseq FX Single Cell RNA Library Kit. Panel A. 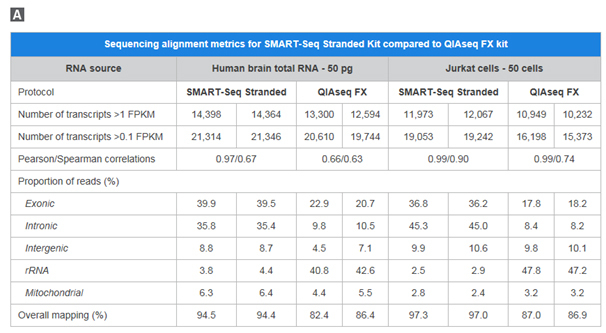 Human brain total RNA (50 pg) and cells isolated by FACS (Jurkat cell line, 50 cells) were used to generate RNA-seq libraries in duplicate with the SMART-Seq Stranded Kit (Stranded) and the QIAseq FX Single Cell RNA Library Kit (QIAseq FX). Following sequencing, human brain total RNA data were analyzed using 2.5M paired-end reads for the Stranded kit, and 5M paired-end reads for the QIAseq FX kit. All data generated from Jurkat cells were normalized to 8M paired-end reads. The Pearson and Spearman correlations were determined between the replicates shown. Panel B . A downsampling experiment with the data generated from Jurkat cells clearly shows that the higher sensitivity observed for the Stranded kit is maintained with lower sequencing depth. Panel C. Assessment of reproducibility between the two kits for the libraries generated from Jurkat cells. Using an expression level cutoff of FPKM >1, the total number of transcripts identified and the overlap between the replicates is much greater for the Stranded kit. 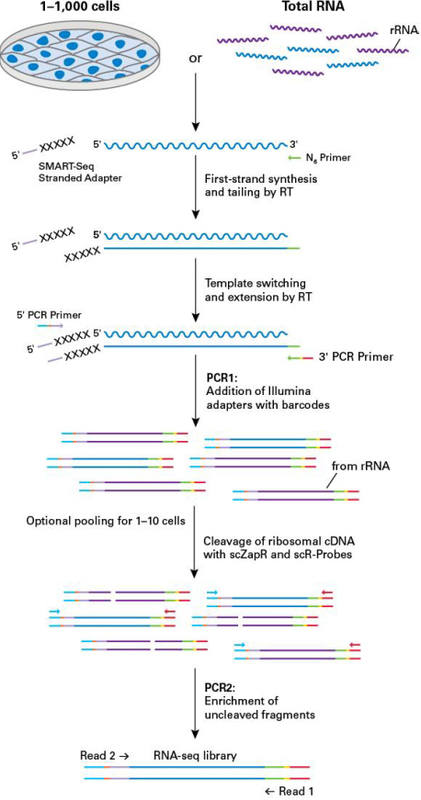 단일세포 (single cell)의 stranded RNA-Seq librar..
Picogram RNA로부터 Strand-specific illumina NGS ..